Have you ever been bothered by the inability to burn videos to DVD? Have you ever used some DVD creators and tried to solve this problem? Is all of the software you’ve ever tried can satisfy your burning needs? In numerous DVD Creators, Roxio Creator can be said to be one of the most excellent DVD Creators. If you have used Roxio Creator, don’t need to go into details, its powerful functions must have certainly brought you a lot of convenience. However, for most users, Roxio Creator is not the best choice for burning videos because of its prohibitive price. For this reason, today in this post I would like to introduce some Roxio Creator alternatives to you, which can provide some of the similar features with more reasonable price. Part 1: Introduction of Roxio Creator? First of all, we need to have a rough idea of Roxio Creator. Roxio Creator is a powerful tool which enables users to add that little pro effect to their photos and videos which make it stand out from the rest. As a multifunctional media program, Roxio Creator is able to let you burn videos to disc with various great tools and it can enable the users to edit video clips, convert any audio/video format into any other desired format. But just as I said above, although equipped with powerful feature and high burning quality, each features it has may not be perfect. Another important reason I don’t recommend Roxio Creator is its high price which is not really commensurate with the function. Therefore, choosing a Roxio Creator alternative is a good idea for you to burn videos to DVD without costing lots of money. Now In this part I’ll recommend the top 3 Roxio Creator alternatives to you so that you can get the better burning experience with less cost. The first and also the best one I’m going to recommend to you is Leawo DVD Creator, one of the popular DVD burners around the world. It is regarded as a top-of-the-class piece of DVD burner software which can convert videos in more than 180 formats to DVD without quality loss. As a top-of-the-class DVD burner software program, Leawo DVD Creator is equipped with the ability to ensure you the fastest burning speed whatever the format you are burning and any other useful functions just like video edition, design the DVD menu and add subtitle and so on. With fast speed and high quality, Leawo DVD Creator is worthy of the best Roxio Creator Alternative. 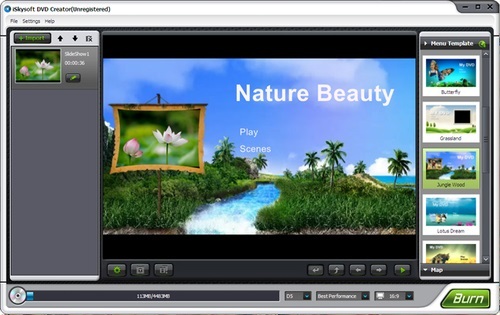 Aimersoft DVD Creator is the professional DVD/Blu-ray burner, which creates local videos from computer or downloads and makes online movies from YouTube, Vimeo, etc. to DVD or Blu-ray disc/ISO/folder. Just like Leawo DVD Creator, No matter it’s a downloaded video or a camcorder video, Aimersoft will help you to burn the videos to your DVD disc with perfect quality. There is no doubt that Aimersoft DVD burner will be one of the Roxio Creator Alternatives. The third one I want to recommend to you is iSkysoft DVD Creator, an powerful DVD Creator that provides the reliable method for you to create DVD with any video file like MP4, AVI, WMV, MKV, MTS etc. With an array of custom DVD templates, you can easily find the right DVD theme for your DVD project. What’s more, you can burn videos and movies to DVD disc and free up more space for other interesting stuff. In my opinion, iSkysoft is also a good choice for you to use it to burn videos to DVD. Now you should have a general idea of these software applications, then I’ll tell you how to use them to burn video to DVD. In order to make sure that you can get the best conversion experience, in this part I will choose Leawo DVD Creator as an example to show you the detail steps. Please try to download and install Leawo DVD Creator in several seconds and then follow the steps below. You can load your videos by clicking the “Add Video” button or you can just use the invert triangle buttons next to the “Add Video” button to import video folder for burning to DVD or drag them to the program. If you want to design the disc menu by yourself, the right sidebar will help you to choose different disc menu templates in different themes like Standard, Business, Education, Childhood, Holiday, etc. You can even design the disc menu with your own image and audio as well. Or if you prefer to keep the original style, “No Menu” option on the right side bar will help you a lot. After finishing the disc menu setting you need to call out the burning settings panel so that you can do some further settings by using Burn to, Disc Label, and Save to options. And then you can start to burn videos by clicking the “Burn” button on the popup burning settings panel. As you can see Leawo DVD Creator has done a very good job and can easily burn videos to DVD disc with the fastest burning speed and the best output quality. I can assure you that it will satisfy you in not only burning videos to DVD but another conversion job. As far as I am concerned, Leawo DVD Creator is the best Roxio Creator Alternative which can assure you get the best burning experience. 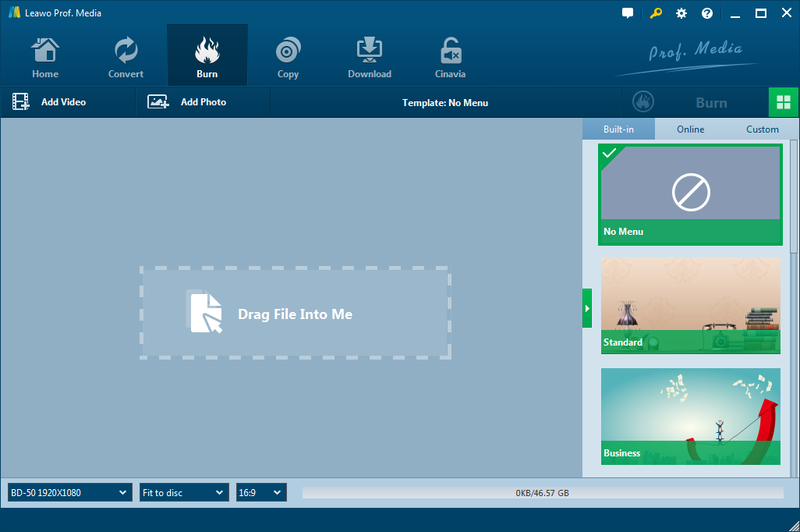 With Leawo DVD Creator, you would be able to easily burn MP4 to DVD on Windows, and of course, other video formats are also supported.